I edited the Drop Pod pics to remove text reference to the Blood Ravens, since the Pods can be used for any Chapter. 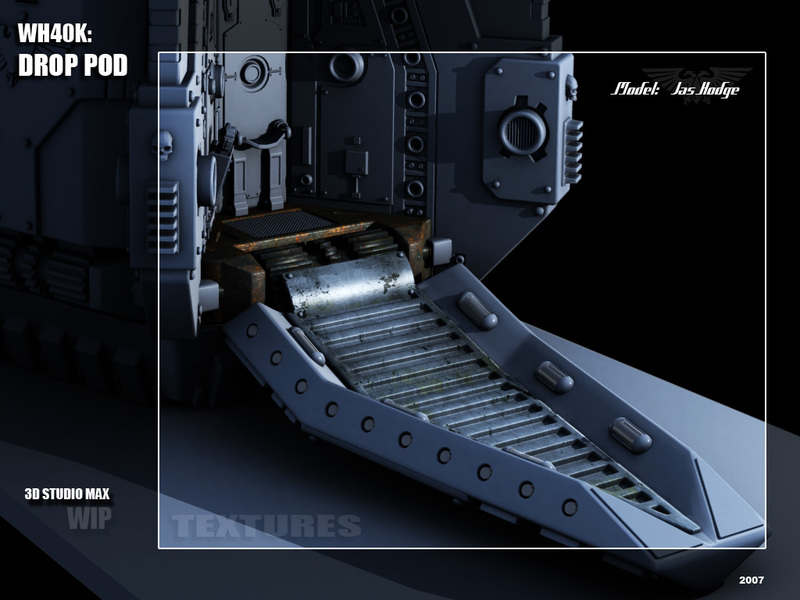 Drop Pods are one-way, sealed, armoured landing craft. Once released they plummet through the planets atmosphere, streaking through the sky, before firing retro jets that brake their decent before landing. Upon landing the pod opens to disgorge Space Marines in to the heart of the enemy. As always your work is excellent dude. 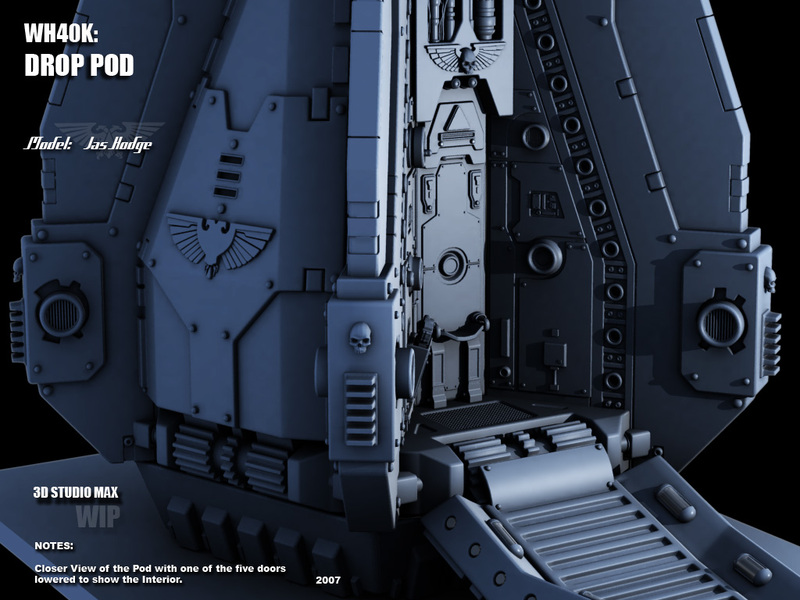 These are Space Marine drop pods. The troops aren't exactly wimps. 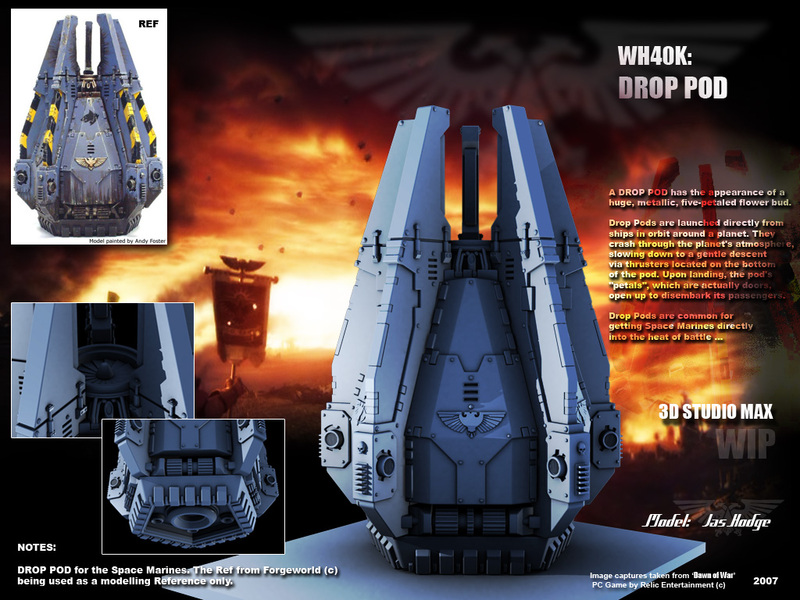 Besides this is 40K when did realism every play a part in it's design!?!? 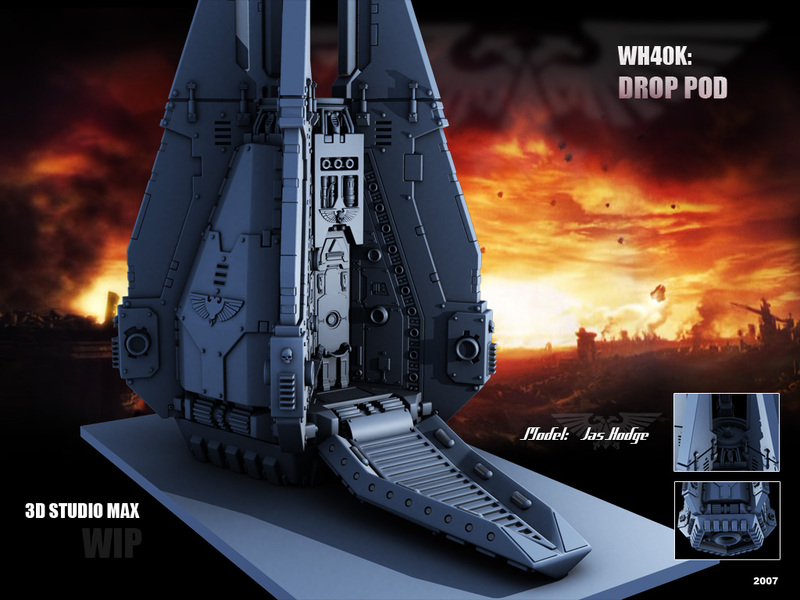 That particular Drop Pod holds five Space Marines, If you look at the base of the pod you'll see that its a Pentagonal shape having Five doors ... Drop Pods are not just restricted to Space Marines, ... There are variants that contain weapon supplies, Missile Launchers, as well as robotic Assault Cannons, once they land, the doors drop, and the Cannons let rip .... Larger Pods can hold a single Mech, like the Dreadnought. 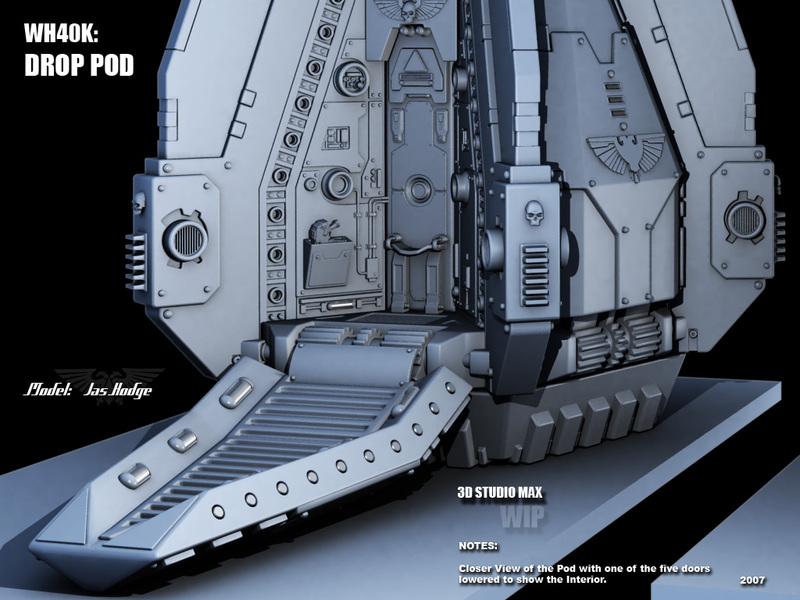 Plus the Pods are re-usable of course, and every Chapter has them as a standard part of their equipment. The Land Speeder looks like a good start. If it's anywhere near as good as the rest of the work it'll be something to be proud of, and of course, you have a marine mesh as a pilot already if you want to make an uncovered version. Anyway, inspirational stuff. 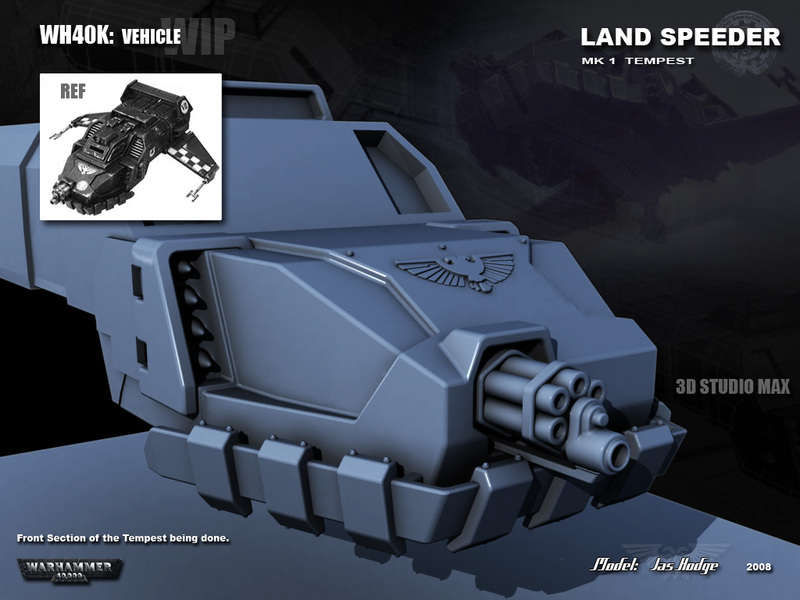 I may give a Land Raider Crusader a try (mostly on account of having just bought one), or a Master of the Ravenwing. Thanks Meph ! !, ... 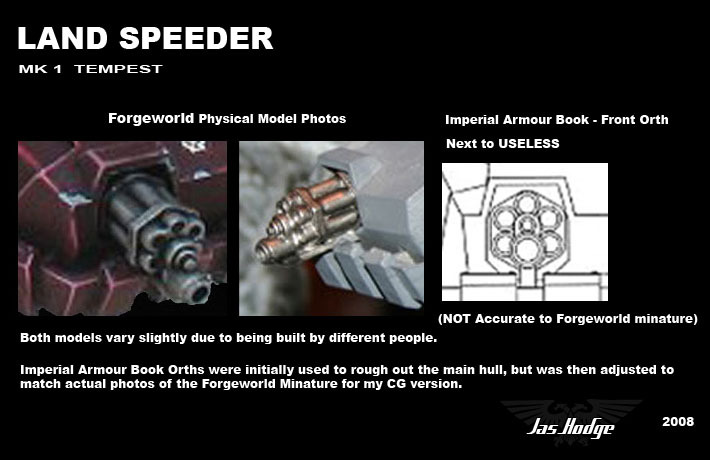 This is how it appears on the Forgeworld Physical Model ... I wasn't actually sure whether this thing rotated or fixed since all the refs I have indicate that it cant rotate (based off the physical model) ... but I see your point, ..
Definatly bad a$$.. nice work. Hmm indeed, the refs are a bit on the just-abit-too-tight side. They seem to have just a bit more leeway than your model but just barely. A soft suggestion, give your gun a bit more clearance and make the big barrel-end sperate like a muzzle just for the firing barrel so that you have 6-7 identical freeloating barrels that can rotate. 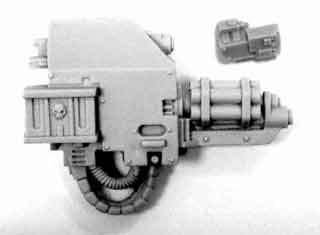 The refs seem a bit unclear about that but I have a landspeeder model at home somewhere and if I'm not mistaken it has fully free rotating barrels and the big barrel is just something like a short flash supressor that is only the bit sticking out in front since behind it the barrels are spinning. Heh yeah the assault cannon in its various guises doesn't really make a lot of sense. Check out the dreadnought one attached - it looks more like a bunch of empty tubes strapped around a single barrel than a functioning rotary cannon/gatling gun. Probably only the early Terminator version actually resembled something realistic. It might be worth having a look at the Blur DoW intro again to see what they did with the assault cannon on their dreadnought. With the Assault cannon the "free-barrels" I think is less to increase the Rate of fire but allow each barrel to cool before it fires again to accommodate the rate of fire and reduce wear on the cannon barrels meaning it may take a couple of hundred thousand rounds to fuse/destroy the barrels instead of 1000..
Binkerman, a beautiful piece of work, i do love what you create. I'm not really into Warhammer at all, but your models look quite impressive. Are you going to make ships from other races like the Tau too?